*This post was sponsored by Visit Puerto Vallarta and the opinions expressed here are our own, as always. The last time Triton and I were in Puerto Vallarta was before the kids were born. Part of a large group of 14 people, we rambled around the city en masse as we tanned, swam, feasted, caroused and slept. Largely in that order. 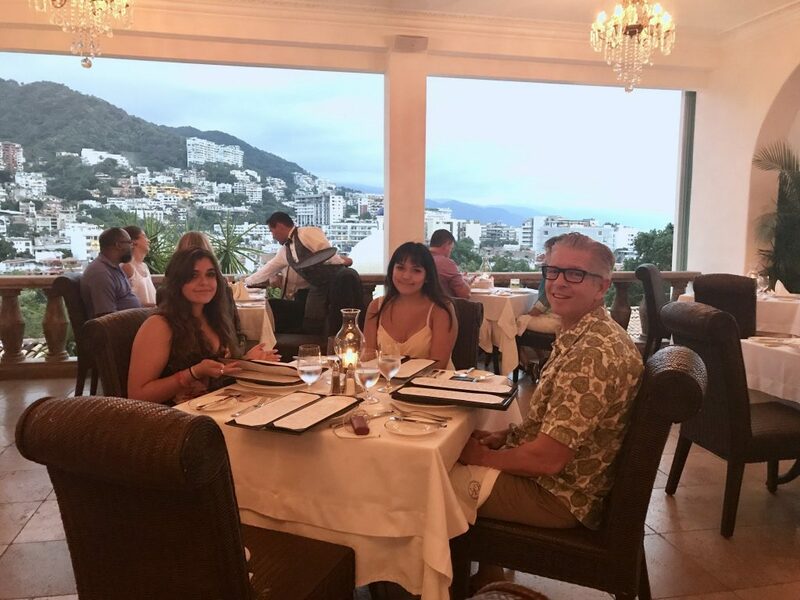 Recently back for our first time to visit Puerto Vallarta with kids, we experienced a fun and more family-oriented vacation. It could not have been much more perfect. 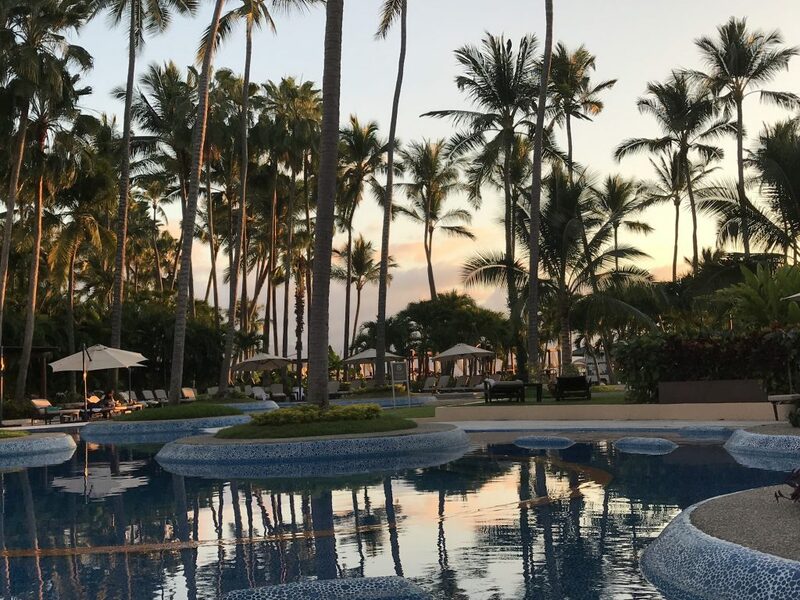 Sunset lounging by the pool at the Westin Puerto Vallarta – both beautiful and relaxing. From the ideal weather to the fun activities and delicious food, our family fell in love with this sweet Mexican town. Truly, Puerto Vallarta won our family’s hearts. Our decision to visit Puerto Vallarta with kids was an ideal way to spend our Thanksgiving holiday. As a family, we’ve visited quite a few destinations in Mexico, and there is something special about Puerto Vallarta. Maybe it’s the warm, swimmable ocean and fantastic undersea views. 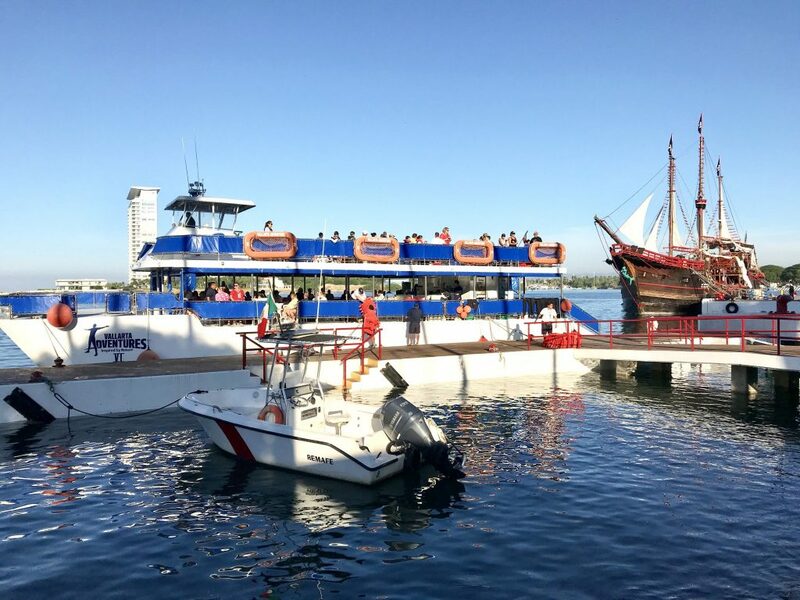 Or maybe we love the array of activities for families both in downtown and out on the water. Maybe it was the plentiful wildlife and colorful tropical birds. 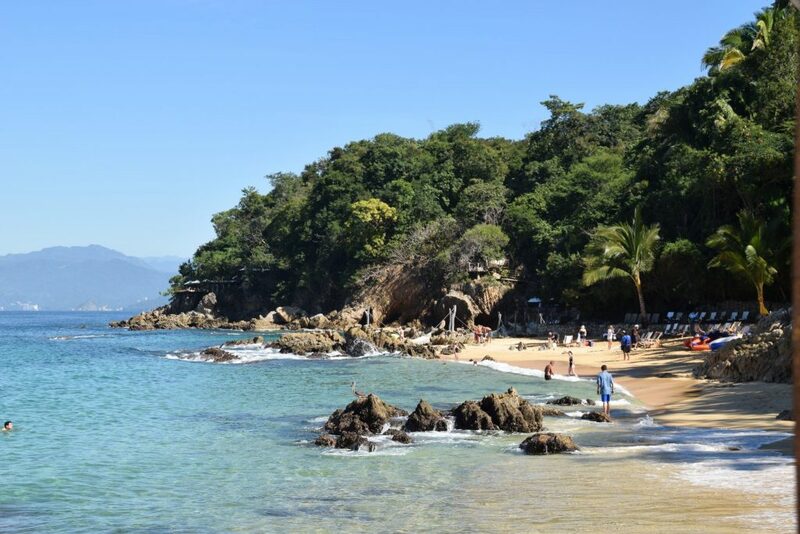 There are so many reasons to visit Puerto Vallarta with kids, we’re already planning to go back! Here’s a few things that made our visit really special. Vallarta Adventures’ boat to Las Caletas was cozy but really fun. The entertainment was pretty hilarious (in a good way). But my gosh, were we surprised when we skirted the coastline south of Puerto Vallarta and passed the famous Los Arcos National Marine Park. What came into view was a tropical paradise, and a huge one at that. We didn’t realize this private beach and playground was dedicated solely to our boat full of people. Suddenly, 200 guests seemed like a tiny number. There is so much to do at Las Caletas. After settling into comfy lounge chairs on the beach, Triton and the girls swam out to a floating pier complete with hammock and umbrella. I stayed on the beach and nursed a gigantic piña colada, watching a flock of green parrots settled onto a nearby post. Kayaks, paddle boards, boogie boards, snorkel sets and even scuba equipment were all available for our use. Later, Ava and I walked up the stone stairways along the water until we reached another beach. Strewn with hammocks, this beach is restful and away from the laughter and happy squeals. The view looking North along the beach at Las Caletas, with the swimming beach on the right. Around the bend further are the kids and teens areas, each with their own set of activities. Kids can play all sorts of fun games both in and out of the water. In the teen area, guests can zipline, ride the waterslide, jump onto a giant water pillow and more. Even the food is great here, all included in the ticket price of $49 per person. Really, this place is a must if you visit Puerto Vallarta with kids. 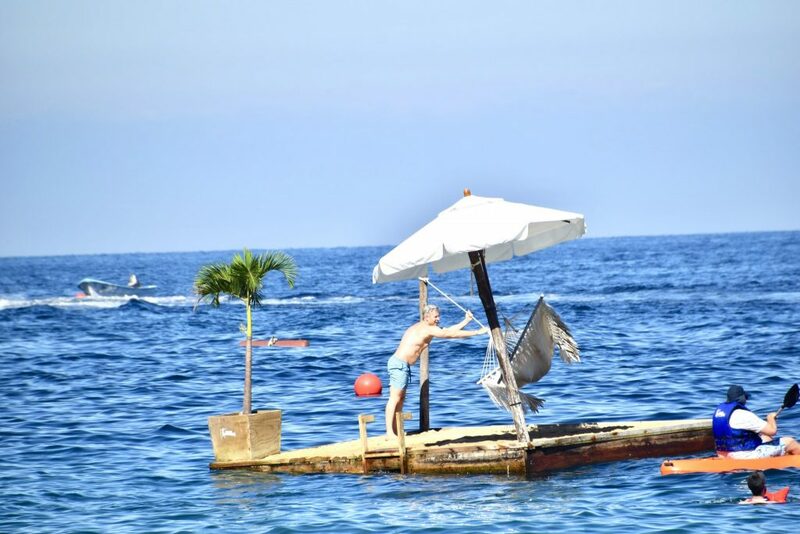 Guests can swim out to several floating platforms off the beach at Las Caletas. Bring your own towels – they don’t supply them for you. Sit on the main floor of the boat near the front left – there are surprises and you’ll be happy you did. Plus good views from the left side. Tip the staff – they work hard to please. For a truly nice dinner in downtown Puerto Vallarta, make advance reservations at the Iguana Restaurant at Casa Kimberly. This place ranks among the best meals and restaurant experiences our family has ever had. Everything about our dinner at Iguana Restaurant was fabulous. Look at that view! 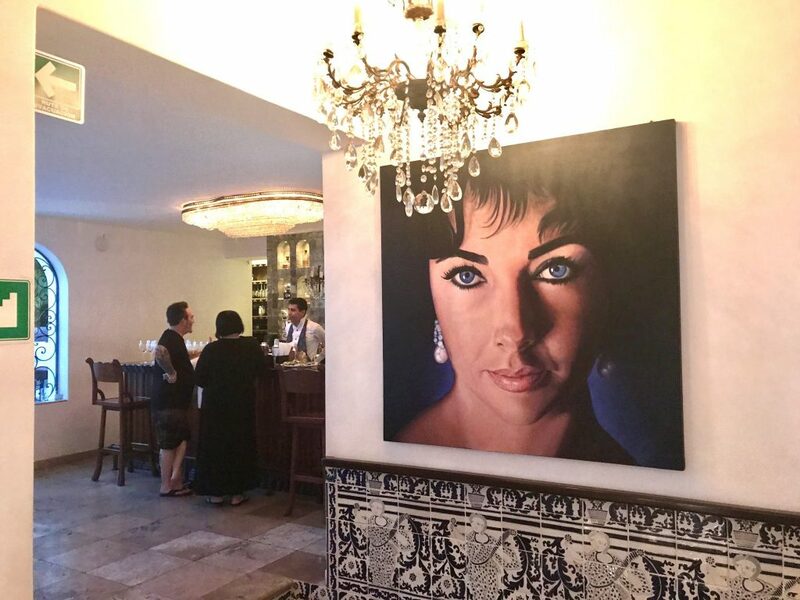 I guess we should have expected something special when we learned Casa Kimberly is located in movie star Elizabeth Taylor’s former home. While filming The Night of the Iguana in Puerto Vallarta with her future husband Richard Burton, they fell in love with each other and this town. She bought this home high on the hills overlooking downtown and the ocean. To be discreet since they were still married to other people, Burton bought the house across the cobblestone street. They built a bridge between the two houses over the street to enable their midnight trysts – how Old-Hollywood of them! The Lady Elizabeth herself presiding over our dinner at Casa Kimberly, famous violet eyes and all. 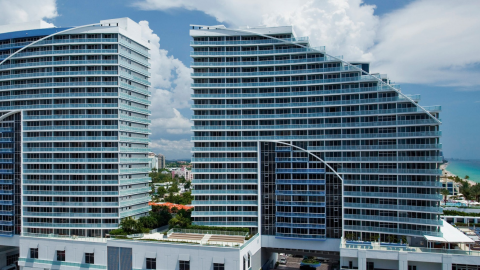 The 5-star Iguana Restaurant is all white linens and china, with impeccable service and the highest quality of food and drink. Open air and with gorgeous views, the main dining room is elegant and casual at the same time. Serving delicious dishes with a hint of Mexican influence, the chef has created a broad menu even this kids were happy with. 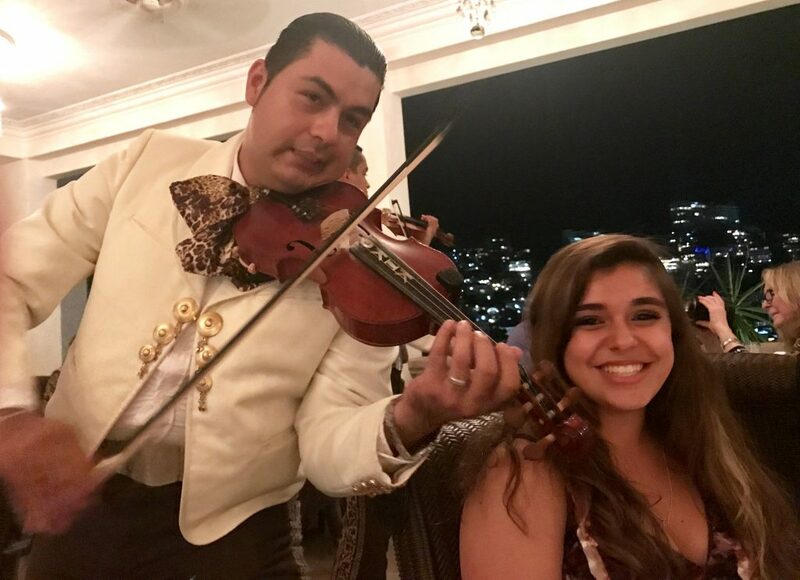 But then came the mariachis – my family and friends know I am not a fan. However, these mariachis are another level. With at least a dozen quality musicians, this band put on a spectacular show that stunned us all. Even the vocals were exemplary, backed by a group of six violinists and the rest. Go. Go for the view, the food, the history of this building. And go for the mariachis. (I never thought I would actually type that sentence). The mariachis serenaded our table at Casa Kimberly’s Iguana Restaurant. Take an uber because it is very hard to find and some taxis even get lost. The front entrance is unassuming. Pull the rope to ring the large bell and someone will come to open the gate for you. Walk around the courtyard and gander at the old Hollywood photos and posters from Taylor’s own collection. 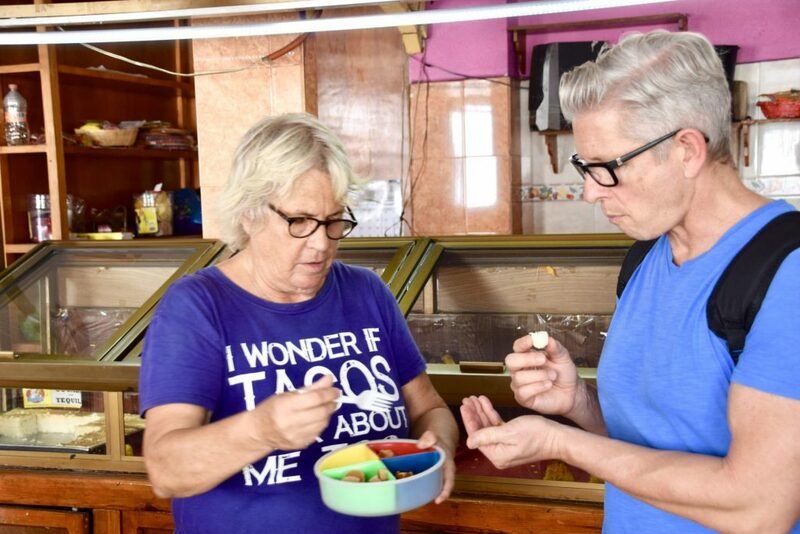 Our family loves a good taco, and this food tasting and cultural walking tour of downtown Puerto Vallarta did not disappoint. We met our guide Shawnie of Vallarta Food Tours in the gazebo of Lázaro Cárdenas Park, and she handed us a map of the eateries we would visit. There were nine of them! From there, we were off to our first stop and our tummies were happy all day. 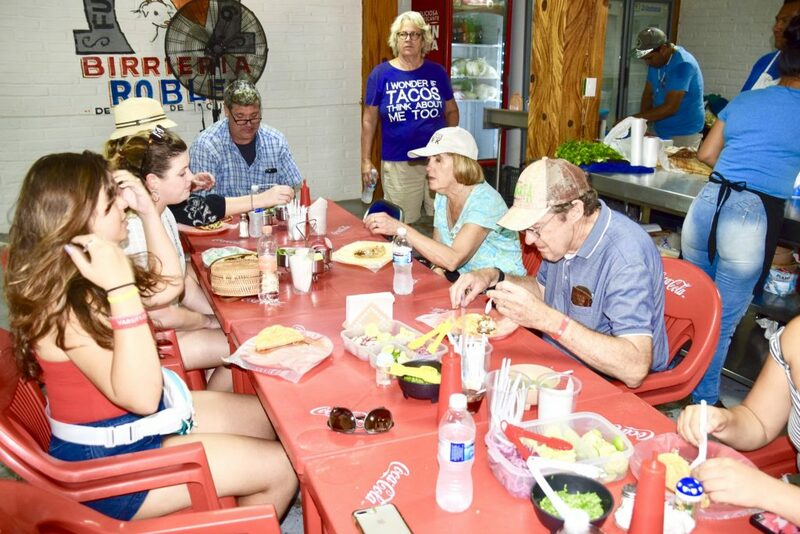 Taco stop on our food tour – catch the tshirt on our guide in the back: I wonder if tacos think about me too! I’ll go into more detail on another post dedicated to this tour, but suffice to say it was a fantastic collection of deliciousness. From street tacos to fresh seafood and everything in between, our taste buds were singing from start to finish. Our last stop on the food tour in Puerto Vallarta was a house-made candy shop. Eat a light breakfast that morning. The tour starts at 10:30 and supplies plenty of food. Wear comfortable shoes. I wore flip flops which was a mistake. Bring your swim suits. The tour ends back at the beach and you can take a nice dip. At another location in Mexico, we had an unfortunate experience with captive dolphins. The girls were super upset at that place because the dolphins were kept in a swimming pool-like tank. 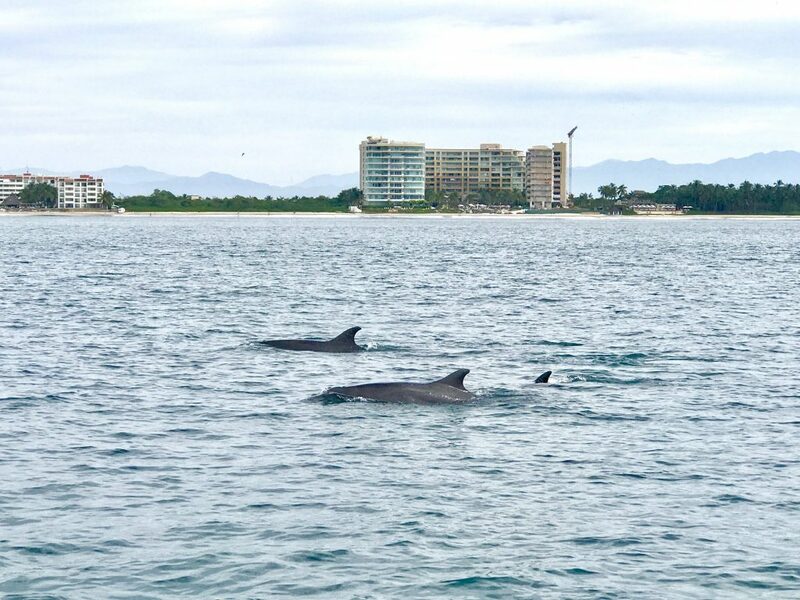 In the case of Dolphin Tour by Wildlife Connection in Puerto Vallarta, the experience is completely opposite. These bottlenose dolphins are observed in the wild, part of a large pod numbering at least 60 members. Our guide and boat captain took us out to the bay where this pod lives, so we could observe them in their natural habitat. They were majestic, and as we approached it seemed almost that they were welcoming us! Some dolphins jumped completely out of the water and dove back in, while others swim gently in the waves. We saw dozens of them, and at some points they were everywhere around us. Dolphins swim off the coast Puerto Vallarta, and if you are lucky you can swim with them! After the dolphins got used to our boat, we slipped into the water quietly so as not to disturb them. Armed with scuba gear and flippers, we swam out into the group. Playful as ever, they surrounded us and swam circles around our family – they were curious about these humans in their midst. We could even hear their calls to each other, that unmistakable high squeal. Some dove beneath us, encouraging us to come along. Others jumped in the air near us, daring us to do the same. Our favorites were the friendly ones that circled us, very close but never touching. Of all the things our family experienced in Puerto Vallarta, this was a true highlight. Rarely do we see both our teen girls smile so broadly at the same time. Winning! Small boat. If you get a little seasick, prepare in advance with Dramamine or wrist bands. The marina where the boat picks you up is random without good signage. It is directly across the street from the Westin Puerto Vallarta if you get lost. Be respectful. Do not touch or try to feed the dolphins – they are wild animals and will not benefit from too much human interference. There are so many great places to stay and things to do when you visit Puerto Vallarta with kids. We wished we had more time to do them all! 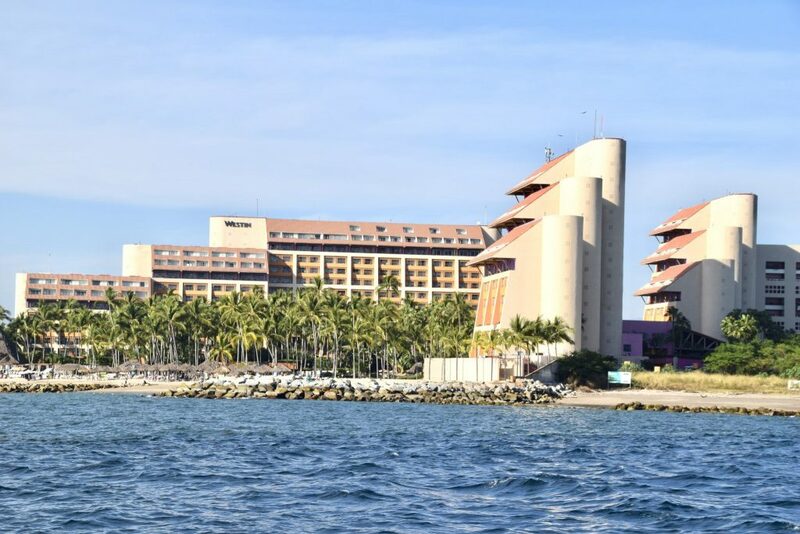 From the water, the view of the Westin Puerto Vallarta architecture and grounds is impressive. Our home base at the Westin Puerto Vallarta was an ideal location. Near enough to the airport that we could get there in 10 minutes, it was easy to arrive and exit. Downtown was a short uber or taxi ride, and the dolphin encounter is directly across the street. If your family plans a lot of activities in Puerto Vallarta proper, we suggest not staying farther north than Nuevo Vallarta. 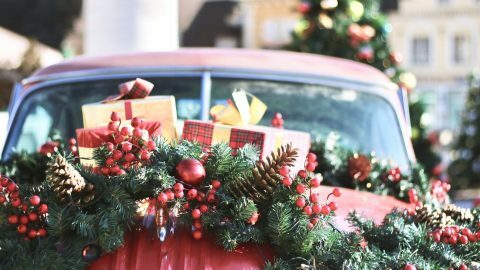 The drive times are long and you will have to leave your hotel very early to reach the excursions on time. Westin Puerto Vallarta rates start at $108 USD.